This symptom is a common symptom associated with anxiety and persistently elevated stress. Many anxious and overly stressed people experience ringing in the ears. The ringing in the ears (Tinnitus) symptom can persistently affect one ear only, can shift and affect the other ear, can affect both ears, or can switch back and forth between ears and over and over again. The ringing in the ears (Tinnitus) symptom can come and go rarely, occur frequently, or persist indefinitely. For example, you may get ringing in the ears once in a while and not that often, get it off and on, or have it all the time. The ringing in the ears (Tinnitus) symptom may precede, accompany, or follow an escalation of other anxiety sensations and symptoms, or occur by itself. The ringing in the ears (Tinnitus) symptom can precede, accompany, or follow an episode of nervousness, anxiety, fear, and elevated stress, or occur ‘out of the blue’ and for no apparent reason. The ringing in the ears (Tinnitus) symptom can range in intensity from slight, to moderate, to severe. It can also come in waves, where it’s strong one moment and eases off the next. The ringing in the ears (Tinnitus) symptom can change from day to day, and/or from moment to moment. Many people notice their ringing in the ears more so when resting, relaxing, and/or when trying to go to sleep. What causes the ringing in the ears (Tinnitus) symptom? Because there are many medical conditions that can cause anxiety and anxiety-like sensations and symptoms, including this one, we recommend that all new, changing, persistent, and returning sensations and symptoms be discussed with your doctor. If your doctor concludes your sensations and symptoms are solely stress related (including anxiety-caused stress), you can be confident that there isn't another medical cause. Generally, most doctors can easily determine the difference between stress- and anxiety-caused sensations and symptoms from those caused by other medical conditions. To be certain, however, you may want to seek a second and even third opinion. If all three opinions concur, you can be assured that stress (including anxiety-caused stress) is the cause of your sensations and symptoms and not another medical or biological reason. The ear, an organ, is comprised of a complex system of nerves, muscles, bones, and pressure that is intricately organized to provide sound and balance information to the brain. Because of its complexity, diagnosing ear-related problems can be difficult. For example, there can be many causes of this symptom, such as exposure to loud sounds, age, ear injury, ear wax build up, ear bone changes, an adverse reaction to medication, high blood pressure, TMJ, head or neck injuries, sinus or ear infection, and a variety of other medical causes. Because of the many causes, it’s wise to discuss this symptom with your doctor. Medical conditions commonly associated with this symptom include Meniere’s Disease, Vertigo, and Tinnitus. While some people may experience satisfactory results from the corresponding treatments, others may not. Although not mentioned on many medical websites yet, recent research has found that ringing in the ears is not actually related to the ears but caused by increased electrical signaling in parts of the brain responsible for auditory processing, including the amygdala – thought to be the fear center of the brain. This new research has found that many people report the onset of ringing in the ears (tinnitus) after experiencing a significant stress or anxiety. So elevated stress, such as stress-response hyperstimulation, is a common cause of ringing in the ears. And this makes sense, since chronic stress, such as that caused by overly apprehensive behavior, increases the electrical activity in the amygdala, which is involved with auditory processing, it stands to reason that chronic stress and its effects can cause ‘phantom’ ringing in the ears due to the way chronic stress adversely affects neuronal production and electrical activity in the brain. Because many people experience this symptom as a result of elevated stress, treatments for Meniere’s Disease, Vertigo, and Tinnitus are ineffective. I (Jim Folk) experienced this symptom, too, and in a wide variety of ways when I was struggling with anxiety disorder. Sometimes one ear was affected and sometimes both ears were symptomatic. I also was misdiagnosed with Meniere’s Disease, Vertigo, and non stress caused Tinnitus. Since anxiety activates the stress response, and since stress responses stress the body, behaving in an overly apprehensive manner can stress the body to the point where it becomes symptomatic. 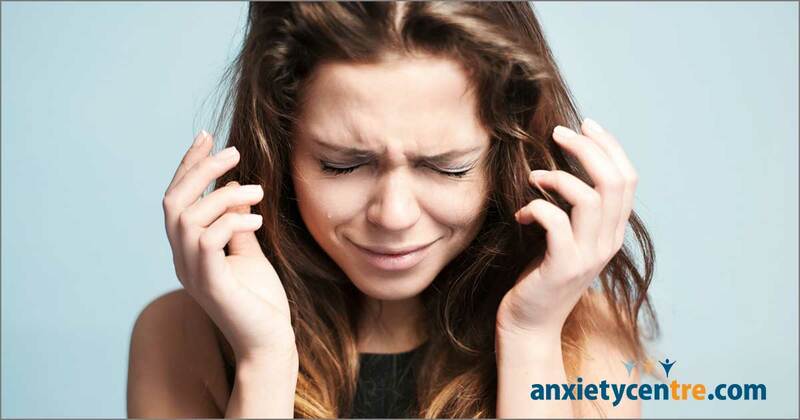 Ringing in the ears is a common symptom associated with stress and anxiety. We see this symptom a lot among anxious people. Stress-caused ringing in the ears is NOT a problem worth worrying about. In fact, worrying about it stresses the body, which can cause ringing in the ears to persist. How to get rid of anxiety associated ringing in the ears? Because stress, including the stress that being overly anxious can cause, is a common cause of the ringing in the ears symptom, working to reduce and eliminate unhealthy anxiety and stress should be the number one priority. Many people have found that as their anxiety and stress are reduced, their ringing in the ears diminishes. The more rested the body becomes, the less of an issue ringing in the ears becomes. Because it can take some time for the body to recover from elevated stress, you may need to work at stress reduction for awhile before meaningful results can appear. Can ringing in the ears cause anxiety? Anxiety occurs when we behave in an apprehensive manner. Therefore, anxiety isn’t a cause in itself, but a result of a certain style of behavior. In this regard, then, no, ringing in the ears doesn’t cause anxiety. But worrying about ringing in the ears can cause anxiety, since worry is apprehensive behavior. As we mentioned earlier, worrying about ringing in the ears stresses the body, which can cause ringing in the ears to persist…which is a common reason why people experience this symptom persistently. anxietycentre.com: Information, support, and coaching/counseling/therapy for problematic anxiety and its sensations and symptoms, including the symptom ringing in the ears.